At the beginning of the 2005 season, I made an attempt to predict the future by looking at the difference between Earned Run Average (ERA) and Fielding-Independent Pitching (FIP) for a bunch of individual pitchers. Actually, the article was originally about line drives, but as we’ve shown in the Hardball Times Annual, line drive rates aren’t really predictable from year to year. Strikeout rates and walk rates are predictable, which is what makes FIP a very useful stat. FIP is based on strikeouts, walks and home runs, and it’s a better indicator of a pitcher’s future performance than ERA is, believe it or not. As you can see, ERA improved for 18 out of the 22 pitchers (82%) who played in 2005, and the group’s 2005 ERA was almost equal to its 2004 FIP (4.58 vs. 4.61). I’m not going to brag too much about this, because anytime you take a list of guys with ERAs over 5.00, you can be sure that they’ll have lower ERAs the following year. It’s called regression to the mean. Well, maybe I’ll brag a little. Brandon Webb was crazy-wild in 2004 and his improvement in 2005 was a direct result of getting that sinker of his in the strike zone. I can’t figure out what’s up with Jeff Suppan—that might be a column for another day—but the deal with Moyer, Glavine and Buehrle was pretty straightforward. Their home run rates went down. A pitcher’s strikeout rate and walk rate don’t tend to change much, particularly once he’s established in the major leagues. However, home run rates can vary quite a big for even long-time veterans. Tom Meagher reviewed this subject in an article last March, and most of his predictions also came true. (Please ignore the Danny Graves fiasco. Nothing to see here, folks. Just move on). As you can see, Buerhle really kept the ball in the park the first half of the year. However, his 2006 home run performance is more likely to represent his 2002-2004 levels, and I won’t be surprised to see his ERA around 4.00 next year. Despite what David Cameron says. In other words, Kenny Rogers allowed 12 fewer home runs than a league-average pitcher would have. That won’t happen again next year, and the Rangers better have lowered expectations for Rogers and Chris Young. 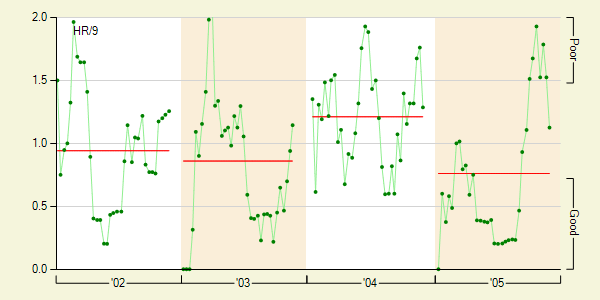 As you can see, both Buerhle and Glavine are also likely see a few more clear the fence in 2006. Most of these guys will do better next year, particularly the ones at the top of the list. So who’s going to pick up Javier Vazquez? By the way, I would write an article using FIP to predict next year’s ERA, but you can actually look that up yourself on our stats pages, where Jeff Suppan is listed as fourth-most-likely to have a higher ERA next year.